MOSS WALLS require little on-going attention reducing service maintenance costs. Unlike live plants that must have suitable environmental conditions and regular care by a professional horticulturist—these works of art will retain their natural appearance and color year over year. 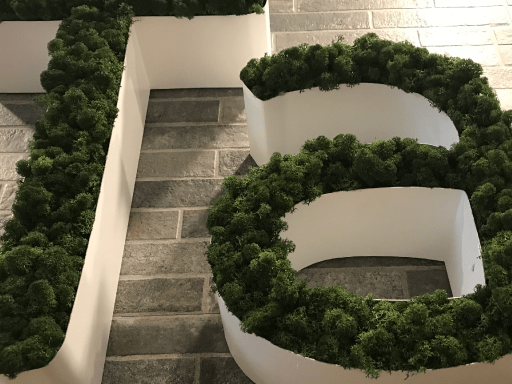 PRESERVED MOSS installations can be placed just about anywhere—from the main focal point of your lobby to the restrooms and even the ceiling! Preserved Moss installations can be placed just about anywhere—even the ceiling! We fabricate preserved moss walls to your exact brand specifications or unique designs. Many clients choose to incorporate their brand identity, logos, taglines or text in any size, shape and type face. First we visit your space to determine the application, design perimeters and your desires for the space. This logo was designed with Open Face Channel letters cfreated with powder-coated aluminum. The Reindeer Moss is placed inside to give an embossed 3D effect. Although Moss Wall Art is organic in style, Mosswall Logos are not creative—they are exact replications of your brand. A vector logo is used to ensure precise dimensions are manufactured to exacting standards. Our design team will render the concept for you to agree on prior to moving into the manufacture stage. As these works of art are completely customized there is little margin of error for mistakes in the design and fabrication process. As your custom Moss Wall elements are completed, our installation team will schedule a date for delivery. Usually we are able to complete this process within one day depending on the scale, complexity of design and placement location.